The author claims that he didn’t know anything about writing fiction. “I can’t bear fiction. I hate it. It’s so untidy. When I was a young man I wanted to be a poet, then I wrote a critical book, and I don’t think I even read a novel till I was about 26 or 27.” Despite this, there are some very vivid descriptions, such as the boy Tommy’s sense of smell and how somebody can become destitute and homeless. Is it a detective novel? If so, there’s no neat ending. 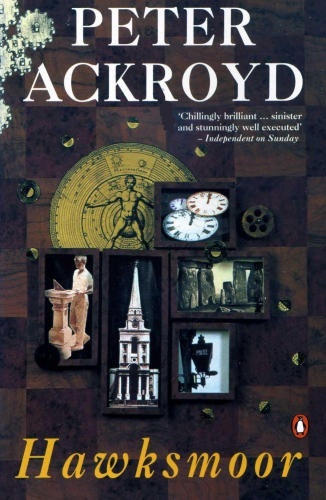 It has been described as an ‘anti-detective novel’ because it subverts the genre. The spelling on the old sections is hard to follow. If followes unofficial 18th century English (characterized by capitalization and Frenchified suffixes such as can be found in Samuel Pepys‘s diary. Characters are contrasted. The rationalism of members of the Royal Society is dismissed: “The Company buzzed like Flies above Ordure” and Detective Hawksmoor’s detachment, shown in his waiting for another murder is outwitted by the irrational. Instead of a new city based on rational thought and science, Dyer sees a monstrous bee-hive, expanding too fast and obsessed with time and news. Alternatively, it could be said that the East End, with its ‘raw’ life, is being pushed out by trade and capitalism; its chaos being encroached upon by ‘order’ as the buildings of the city’s financial sector grows beyond its boundaries. Different people inhabit the city at different times of the day: suited businessmen during working hours, criminals by night. Although millions pass by the same landmarks, each has a subjective map of associations inside his head and approaches it from different reference points. However, there is something about Hawksmoor’s churches that draws history towards them. It is as if they were built on leylines. Maybe some commentators are reading too much into what might just be a hodgepodge that subverts reason and where sanity and madness are mixed up. Maybe the whole thing is really a graphic description of Hawksmoor’s mind as he approaches mental breakdown. Others found the book irritating and difficult and wondered whether a book should speak for itself rather than readers having to google to get explanations and interpretations. Maybe some of us might take a tour/pilgrimage to see these churches, stopping at the many alehouse en route. Oct 2012 “I have liv’d long enough for others, like the Dog in the Wheel, and it is now the Season to begin for myself: I cannot change that Thing call’d Time, but I can alter its Posture and, as Boys do turn a looking-glass against the Sunne, so I will dazzle you all. “Is Dust immortal then, I ask’d him, so that we may see it blowing through the Centuries? But as Walter gave no Answer I jested with him further to break his Melancholy humour: What is Dust, Master Pyne? And he reflected a little: It is particles of Matter, no doubt. Then we are all Dust indeed, are we not? “Then as we passed down this Passage we were knocked against certain Women of the Town, who gave us Eye-language, since there were many Corners and Closets in Bedlam where they would stop and wait for Custom: indeed it was known as a sure Market for Lechers and Loiterers, for tho’ they came in Single they went out by Pairs. This is a Showing-room for Whores, I said. Hey ho the Devil is Dead! Eat, drink, and go merry to Bed! “We went back into the Mens Apartments where there were others raving of Ships that may fly and silvered Creatures upon the Moon: Their Stories seem to have neither Head nor Tayl to them, Sir Chris. told me, but there is a Grammar in them if I could but Puzzle it out. This is a mad Age, I replied, and there are many fitter for Bedlam than these here confin’d to a Chain or a dark Room. “This mundus tenebrosus, this shaddowy world of Mankind, is sunk into Night; there is not a Field without its Spirits, nor a City without its Daemons, and the Lunaticks speak Prophesies while the Wise men fall into the Pitte. We are all in the Dark, one with another. And, as the Inke stains the Paper on which it is spilt and slowly spreads to Blot out the Characters, so the Contagion of darkness and malefaction grows apace until all becomes unrecognizable. Thus it was with the Witches who were tryed by Swimming not long before, since once the Prosecution had commenced no Stop could be put to the raving Women who came forward: the number of Afflicted and Accused began to encrease and, upon Examination, more confess’d themselves guilty of Crimes than were suspected of. And so it went, till the Evil revealed was so great that it threatened to bring all into Confusion. “I have long been of the Opinion, says he, that the Fire was a vast Blessing and the Plague likewise; it gave us Occasion to understand the Secrets of Nature which otherwise might have overwhelm’d us. (I busied my self with the right Order of the Draughts, and said nothing.) With what Firmness of Mind, Sir Chris. went on, did the People see their City devoured, and I can still remember how after the Plague and the Fire the Chearfulnesse soon returned to them: Forgetfulnesse is the great Mystery of Time. These were the Accidents of Fortune, Nick, from which we have learned so much in this Generation. It was said, sir, that the Plague and the Fire were no Accidents but Substance, that they were the Signes of the Beast withinne. And Sir Chris. laughed at this. At which point Nat put his Face in: Do you call, sirs? Would you care for a Dish of Tea or some Wine? Some Tea, some Tea, cried Sir Chris. for the Fire gives me a terrible Thirst. But no, no, he continued when Nat had left the Room, you cannot assign the Causes of Plague or Fire to Sin. It was the negligence of Men that provoked those Disasters and for Negligence there is a Cure; only Terrour is the Hindrance. “It is one of the greatest Curses visited upon Mankind, he told me, that they shall fear where no Fear is: this astrological and superstitious Humour disarms men’s Hearts, it breaks their Courage, it makes them help to bring such Calamities on themselves. Then he stopped short and looked at me, but my Measure was not yet fill’d up so I begg’ d him to go on, go on. And he continued: First, they fancy that such ill Accidents must come to pass, and so they render themselves fit Subjects to be wrought upon; it is a Disgrace to the Reason and Honour of Mankind that every fantasticall Humourist can presume to interpret the Skies (here he grew Hot and put down his Dish) and to expound the Time and Seasons and Fates of Empires, assigning the Causes of Plagues and Fires to the Sins of Men or the Judgements of God. This weakens the Constancy of Humane Actions, and affects Men with Fears, Doubts, Irresolutions and Terrours. I was afraid of your Moving Picture, I said without thought, and that was why I left. It was only Clock-work, Nick. But what of the vast Machine of the World, in which Men move by Rote but in which nothing is free from Danger? Nature yields to the Froward and the Bold. It does not yield, it devours: You cannot master or manage Nature. But, Nick, our Age can at least take up the Rubbidge and lay the Foundacions: that is why we must study the principles of Nature, for they are our best Draught. No, sir, you must study the Humours and Natures of Men: they are corrupt, and therefore your best Guides to understand Corrupcion. The things of the Earth must be understood by the sentient Faculties, not by the Understanding. “DYER. (Sits down) There was nothing that I recall save that the Sunne was a Round flat shining Disc and the Thunder was a Noise from a Drum or a Pan. VANNBRUGGHE. (Aside) What a Child is this! (To Dyer) These are only our Devices, and are like the Paint of our Painted Age. “dyer. (Looking at him scornfully) So that is why Wits swarm like Egypt’s Frogs. If I were a Writer now, I would wish to thicken the water of my Discourse so that it was no longer easy or familiar. I would chuse a huge lushious Style! vannbrugghe. (Interrupting) Ah the music of Erudition, it is unimaginable to weaker Wits. “from what Purse are we building these Churches, Walter? From the Imposicion on Coles. And are the Coles not the blackest Element, which with their Smoak hide the Sunne? Certainly they feed the Fires of this City, says he. “VANNBRUGGHE. (Spitting upon the floor) But the bounds of the Mind are yet unknown: we form our Judgments too much on what has been done without knowing what might be done. Originals must soar into the region of Liberty. DYER. And then fall down, since they have Wings made only of Wax. Why prostrate your Reason to meer Nature? We live off the Past: it is in our Words and our Syllables. It is reverberant in our Streets and Courts, so that we can scarce walk across the Stones without being reminded of those who walked there before us; the Ages before our own are like an Eclipse which blots out the Clocks and Watches of our present Artificers and, in that Darkness, the Generations jostle one another. It is the dark of Time from which we come and to which we will return.